By now, my friends are used to statements like this gushing from my mouth. If anything, I am the Queen of Crazy Ideas. And because insanity loves company, my friends are the ones who get stuck on the other end of my call to action- whether that action is wedding-crashing or fencing lessons (c’mon, who didn’t want to sword-fight at least once as a kid?) or just seeing if Absinth really does make you hallucinate. I used to feel torn about my ravenous hunger to try new (and preferably weird) activities. People would chide me for not being considerate enough (or fearful enough) of my health or telling me outright the big old “NO!”. This wasn’t just limited to physical activities, but also to any situation that might put “stress” on me – even becoming an excuse to deliberately keep information from me that might be upsetting (such as my mother needing shoulder surgery). And, deep down, I would wonder if they were right. Maybe I should just stay home, twiddle my thumbs and stare at the ceiling for the rest of my life. Safe. Protected. Bored out of my skull. Then I found an article that hit home for me. No, I don’t have Asperger’s as the article’s writer does, but I think the article applies to everyone. It all boils down to a simple question: what do you want most in life? Do you want stability more than excitement, or vice versa? There is no wrong answer, just a choice of priority. When you have lupus, prioritizing is a fundamental skill. I got a -2 on the test, which indicates, as the writer puts it, that I am “-2 to 2 You are suspiciously well balanced. Or lacking a self-identity. I’m not sure which.” In the end, I want to be interested by life. I want to explore new experiences, thoughts, adventures – and there’s no reason to let my illness stop those plans dead in there tracks. However, that also doesn’t give me license to be reckless. It’s not much fun being laid up in bed with a cast or a flare, now is it? So here are some tips for making all your crazy ideas easier (and a little safer) to accomplish. List your goals. A little organization goes a long, long way. Grab some paper, a pen, a 5 quiet minutes to think to yourself, What have I always wanted to do? No matter how nuts it may sound, write it down. Nobody’s looking. Do you want to skydive? Go on a safari? Start your own business? Travel the world? Dig Deep. Once you have your list, look it over carefully. Are there any patterns you notice? Is there a deeper reason for choosing the things that you did? 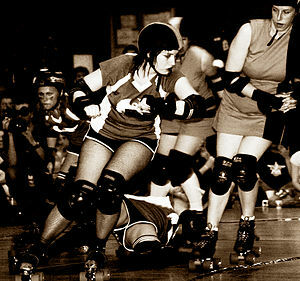 For me, I think I’m particularly interested in Roller Derby because I have a lot of anger that’s never found a satisfying (and legal) outlet. I always enjoyed aggressive sports as a kid (I rocked at Dodgeball) because it was my chance to get back at all the kids who teased and bullied me and not get in trouble myself. You don’t have to have a noble reason – be honest. Get to the essence of what you’re looking for. Evaluate. Research what you need to do. For example, I can’t just show up at a rink and magically be a Derby girl. It’s a demanding, sometimes dangerous athletic sport and I don’t even own a pair of skates. Be brutally honest with yourself – are you willing to work step-by-step to make your idea happen? Are you willing to invest time, money, and energy into seeing it through? If not, then maybe you need to compromise and focus on an easier goal. Make a plan. There’s nothing wrong with starting off small. A good place to start is finding blogs written by people who have done what you want to do. I mean, there are blogs for everything out there, a Google search should turn something up. Post comments, ask questions. Make another list of ideas to get you started. For me, getting a pair of skates and learning the basics of skating would be a good start. From there, adding some exercise to increase my endurance is another idea. Going to some bouts is another idea. Be patient. Don’t get so caught up in the end goal that you take dumb risks. There is no rush, no race. If possible, try to enjoy every step of the journey instead of getting fixated on the end of it. Be ready to compromise. Hate to break it to you, but sometimes you just won’t get what you want. If either time or money or health really has stopped you flat (and I mean really stopped you), go back to Step 2. See where you can compromise. Can’t run a whole marathon? Would you still feel good if you walked it instead? Or if you ran a half marathon? If you’re looking for a feeling of accomplishment, then maybe those options would work for you. Find activities that satisfy the essence of what you’re looking for. While I have no plans for competing professionally in a Roller Derby league, here in New York City, they’ve started a recreational one that I might try for. I don’t need to be a star, the pro. I just want to get in the game. What crazy plans have been lurking in your mind, and what first step can you take to make them a reality? This entry was posted in Uncategorized and tagged adventure, choice, excitement, happiness, health, lupus, motivation, planning, prioritizing, Roller Derby. Bookmark the permalink.